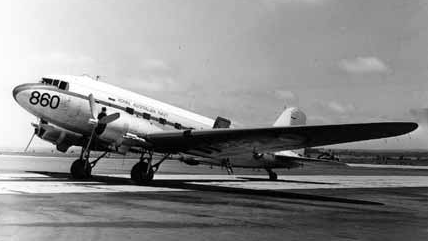 Four ex - RAAF DC-3 Dakota (C-47A) were operated by the RAN over the period 1949 to 1977. Two aircraft were obtained in 1949-50 and were converted into ‘flying classrooms‘ for Firefly AS6 observers. Four stations for navigation and four stations for anti-submarine detection were installed in the aircraft. Other modifications included installing sonar buoy racks under the wings and a half door allowing for the use of a hand held camera. After the Sea Venom and Gannet aircraft were introduced into service the DC-3’s were equipped with a Gannet retractable radar scanner unit for observer training. 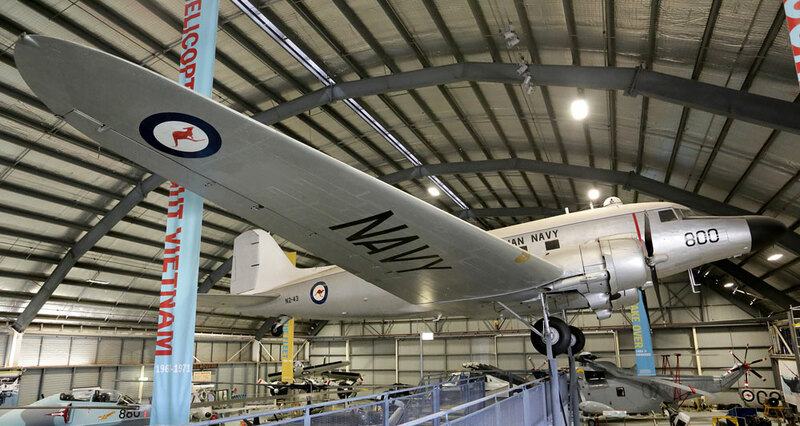 A Sea Venom radar scanner was installed in one of the Dakota’s as well. Another two Dakota’s were acquired in 1968 for use as navigational training aircraft and operated by VC 851 Squadron. Two of the Dakota’s were sold in 1974-77 while the others were retained by the RAN as Museum exhibits. Left: A DC-3 modifiied for navigational training. Right: Three RAN DC-3 fly in formation over Nowra in the late 1960's.